I don't know about you, but I enjoy watching the occasional TV show. No, not sports, reality TV, or any of that junk (yuck!!)! I'm talking about regular old TV: Sitcoms. Dramas. Dramedy. Science Fiction -- you know, TV shows! Even with cable, there are those occasional shows I can't watch ... for instance, where I am now, I have no way to watch the Sky Network ... which, for me, means I would have missed "Stan Lee's Lucky Man" (!!). In this article, I will show you how to watch TV on your computer, using a few websites, a couple of browser extensions/add-ons, and a free program that runs on multiple platforms which will allow you to watch your TV show whether you're online or not, in full-screen mode! ... all for the cost of your monthly Internet bill! Pretty cool, huh? Well ... I think it's cool ... and soon, so will you! "A Long Time Ago, In A Neighborhood Not Too Far Away ..."
Unfortunately, the way I was watching TV shows on my computer back then was a bit more complicated, and (of course) that method stopped working on Windows ... which is one of the reasons I didn't release this article a couple years ago. The other reason was because that method stopped working a few months years back on my Mac, which necessitated finding a different way to compensate for that loss! And you'll be pleased to know, I found one! Essentially what I'm doing is locating a show I want to see on a few websites (listed below), start it playing, pause it, then activate one of the browser extensions which allow you to download a video, which then saves it to my "Movies" folder, where I later watch it using the *FREE* multiplatform program, VLC. What that is is that video player I mentioned up there, playing an episode of "The Librarians" (now canceled, unfortunately, after a "new guy" was hired to run things over at the TNT network. Let's just say that cancellation wasn't a very popular decision with the fans of the show after four seasons!). 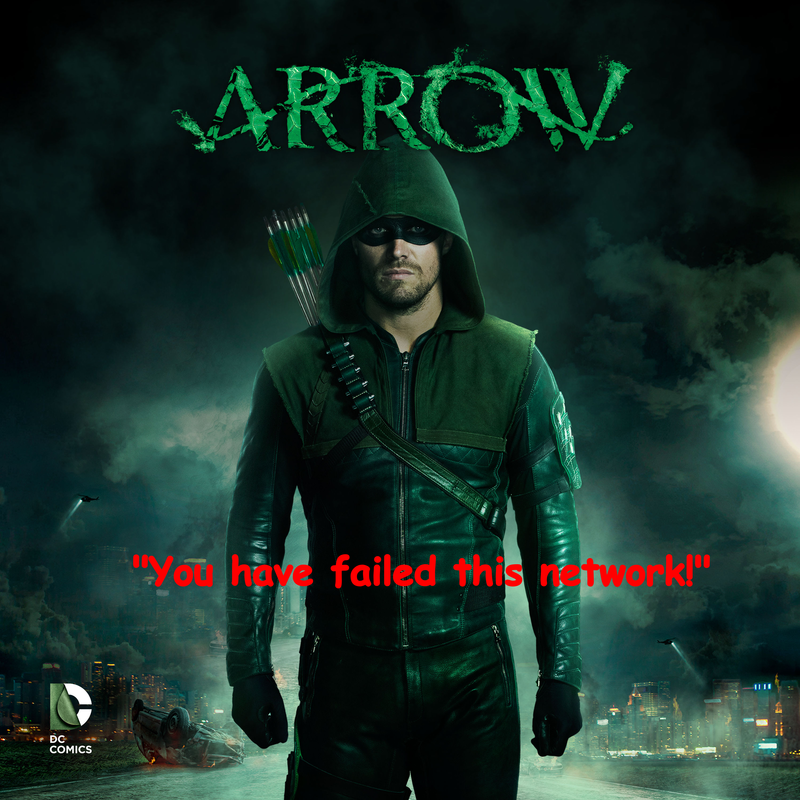 "You have failed this network!" 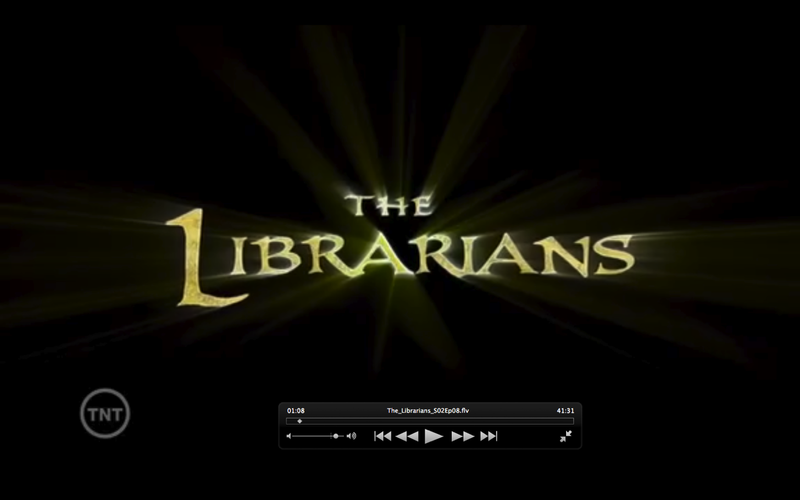 Note that the controls in that shot from "The Librarians" are only visible because I have my cursor where they would normally appear so that you can see them for the screenshot. ... but now, let's move you a bit closer to that "ultimate goal." Those two extensions will help keep your web browser safe from unwanted pop-ups -- though sometimes one might sneak through, but most of the time before you can switch to it, one of the extensions will have killed it for you. Even better, apparently AdBlock Plus updates itself at least once a week; not sure how often uBlock Origin updates itself, though. Next you're going to need an add-on with which to download videos ... and for my fellow Mac users that are using Safari, as I write this, there are no extensions or add-ons for downloading videos available right now. Hopefully, though, that will change in the not-too-distant ... but that's why I have six web browsers on all of my Macs. Those of you on Firefox or Internet Explorer can use Ant Video Downloader. If you're using Chrome or Opera, look for Video Downloader Pro. ... is the open source, multiplatform VLC ... and it even works on Mac OS 10.6.8, or Snow Leopard, which, for some odd reason, no longer has support from any of the web browsers -- and even DropBox!! -- which is why I had to upgrade my MacBook Pro recently. As you probably already know, Firefox recently had a major update, which, unfortunately, broke several of the extensions and add-ons. When using the Ant Video Downloader on an older build of Firefox, you would start the video playing, click on the Ant Video Downloader's icon in your browser, and you should then be able to select which video you want to download. The way it works now is when you click the icon in your browser, it opens another tab, which shows all of the videos you watched so far, vice just the one you want to download right now. In short, it makes for a messy interface crappy user experience. Hopefully, the developers are working on making the user experience better in a future build ... but I have removed it from all of my systems after that "update." Once you have everything installed and/or downloaded, you're ready to take a look at the links I use to feed my TV watching habit! That is -- er, was -- the original CouchTuner. The rest are -- er, were -- apparently all copies. ... which I didn't have before. ... and which also appears to be dead now! Thankfully, after a bit of time, it came back, and you can find that one here! While trying to feed my weekly daily TV watching habit, I clicked on the above link ... and it didn't work! ... which apparently is the rebirth of the original CouchTuner. One could tell by the discussion on some of the older episodes ... and the comment, "I thought this site was closed for good ..." was a big hint as well. 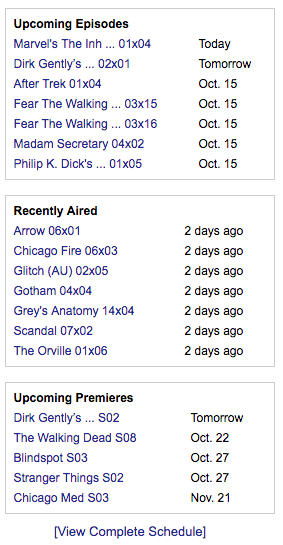 ... so here's a new weekly schedule that should help feed your TV watching habits. 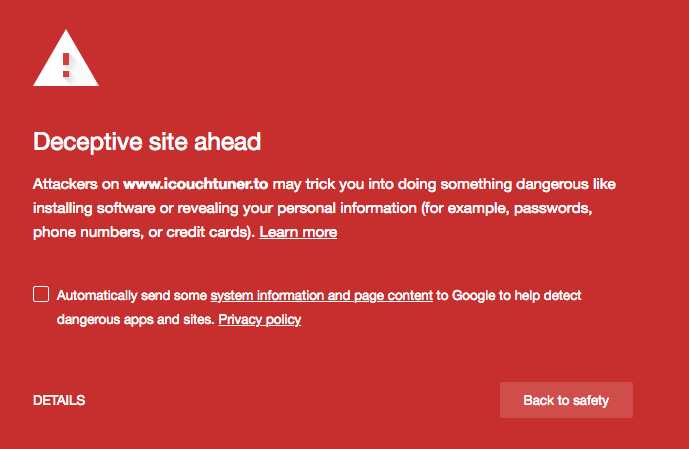 The second one is apparently now couchtuner.cloud click (clickable link below). Just wanted to take a quick second or two to let you know that there used to be about five or six links just for CouchTuner sites, but many of them are now either gone or have become one of the other CouchTuner sites, which is why there are a few less than there were when I started working on this one some (*mumble-mumble*) years ago, when I was using a different method to watch these shows that I couldn't replicate on Windows. If you happened to notice that the word "cloud" had a line through it up there, then you can probably guess what happened. 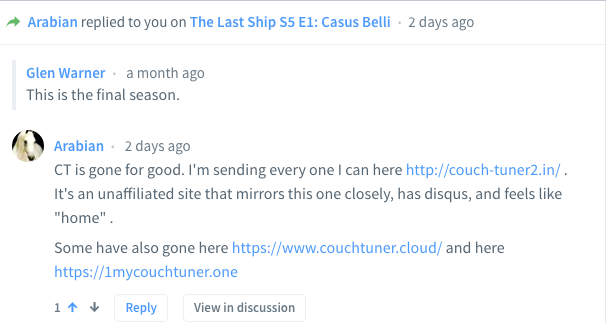 Also, all of the CouchTuner sites tend to put up the date the show was uploaded, so ensure that the date of the first show listed is rather current, as opposed to, say, three months ago. Of course, I shouldn't need to remind you that you don't have to sign up for anything to use these sites ... and on most of them, if you have a Discus account, you can log in with that if you want to make a comment or two, but otherwise, don't sign up for anything. This one was my "go-to" site for downloading TV shows back in the day, and I still use it from time to time -- but only if I can't find what I'm looking for on any of the CouchTuners. I had the wrong address for Geek TV for a bit, but deleting a couple letters at the end of the address was good enough to get something that actually looks like it's being updated, so that's something. I discovered that "new address" while searching for a different version of the site, which is what led me to that "new" address ... which I actually thought was a different site! Testing in progress ... but it looks like this one requires some finesse when searching, so make sure you take a look at the searching instructions. That search got me exactly what I was looking for. ... which, as you might guess, didn't work at all ... so don't do that. That one looks for *JUST* the title you typed in there, and not any odd variants. Sadly, it only came up with a few episodes from the remake. Watch Series (http://dwatchseries.to) used to be one of the sites I would go to when I had trouble finding what I was looking for on one of the CouchTuner sites, but of late, they have been presenting me with a gray screen where I can't click anything, with a suggestion about turning off Adblocker before it will allow access the site ... and the way around that -- if it should occur for you -- would be to simply refresh the page. Hmm. It's been a few weeks since I wrote that update up there, but now when I try to use that site, I select a show I want to see, click on one of the links provided, and it instantly gets shut down. Might be best to avoid this one. ... which appears to work much better so far. "But Wait ... What's *THIS* ...?!?" While testing this and that, I tried the original Watch Series website again, and once again, I was presented with that "Turn off your ad blocker" message, and I closed the window ... and then re-opened it, and found that I could use the site again with no problem! I did a couple tests, searching for both "My Favorite Martian" and "Hill Street Blues," and I had good results with both! Unfortunately, I was using a browser that does not allow my video downloading extensions to be installed, but the mere fact that I could see the two episodes playing means it should work, so there's that. Let Me Watch This (http://www.watchfreemovies.ch/watch-tv-shows) is also worth a look from time to time. As a test, I just tried to download the third episode of the second season of "The Good Doctor," but about ten of the 141(!) links that were available were dead ... but fortunately number eleven was not, so that's being downloaded as I write this. There were a couple of pop-ups along the way, but Chrome was kind enough to block the download of an installer I didn't ask to be downloaded, so that's something. Now, if I could *JUST* get the various video downloader extensions I have installed in Chrome to allow me to specify where to download the file and save it with a file name *I* specify, that would be great! Recently, I discovered a YouTube channel called "AfterBuzz TV." Basically, if there's a TV show you're interested in, there's probably an AfterBuzz show that talks about it ... and it's a good thing, too, because shows like "The Magicians" and the now-ended (but still excellent) "Orphan Black" could always use some expert commentary which should hopefully clear up some of the things that went by too quickly for you to notice ... which is a lot of the stuff in both "Orphan Black" and "The Magicians." There was also an official after-show for "Orphan Black," called "After the Black", but it only ran concurrent with seasons three and four, while the AfterBuzz show started at the beginning of season two with a wrap-up of the first season. Alas, fans of "Blindspot" only got two seasons before the after-show was canceled, but if you've never watched "Blindspot" before, you're in luck! 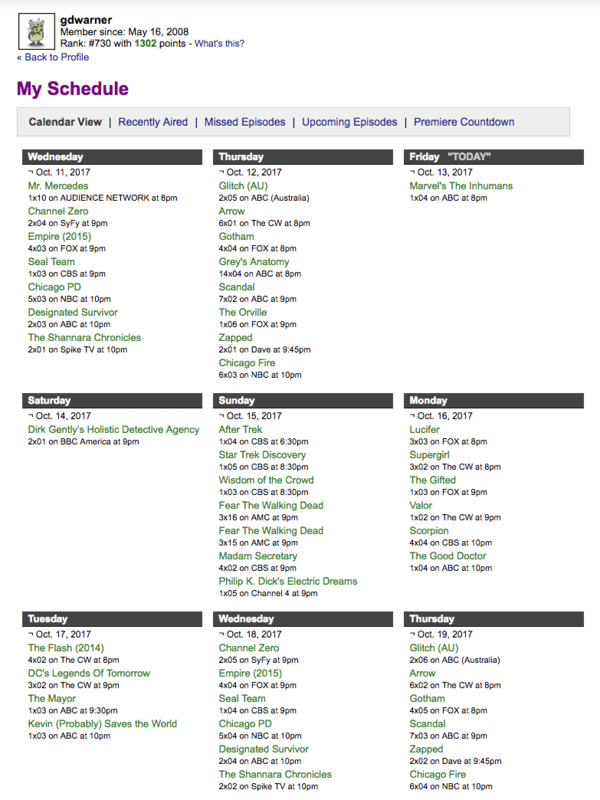 ... and if you want to check to see if your favorite show is available, all you have to do is go to a YouTube video -- or just YouTube.com -- and type in, say, "Counterpart" "AfterBuzz TV" in the Search field, and you should be able to find what you're looking for. Of course, if you don't want to watch those "AfterBuzz" shows online, you can simply download them with 4k Video Downloader, which works on both Macs and PCs (sorry, Linux folks ...! Of course, chances are good you already have something for that ...). "How do You Know What's Coming on and When?" Pretty cool, huh? Alas, like I said up there, it no longer functions, so I have to rely on two websites to track what I watch -- Share TV and TV Maze. For ease of use, you should create an account (free!!) on both of these sites, because one might get information on a new show before the other one does ... but more importantly, if you don't have an account, you will be shown all of the shows that are airing that day or month, as opposed to the shows you actually watch. 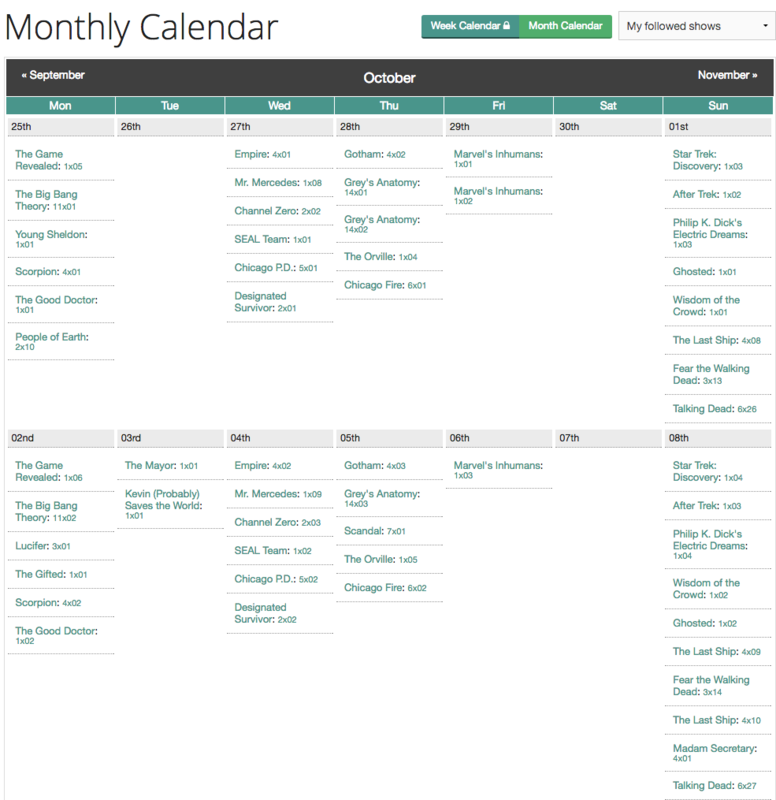 As an example, I found a show from the UK while goofing off -- er, looking around on TV Maze called "Doctor Foster," so I will use it to show you how to add stuff to your calendar for both websites. To add this show to your list of shows you like all you have to do is click that green "Follow" button, which should make any new episodes appear on your calendar. ... and from that menu, you make the appropriate choice. In this case, unless you've never watched the show before, you would select "Currently Watching." ... and that will make it appear on your calendar. ... and that, ladies and germs, is how I keep track of what's on and when. 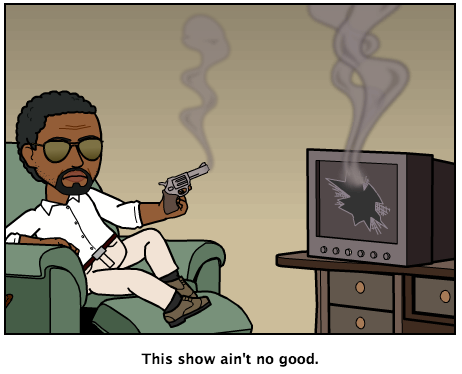 Sometimes I might not get to a given TV series until ... well. Quite a while after I have downloaded it, so I find that it is important to have a naming system which will keep all of the episodes in the proper order. ... where you have the name of the show, the appropriate season, and the episode number. One of the things I like about this one is that I can have it installed on two computers, and as long as I am logged into the Junecloud servers on both computers, any change I make in one computer's Notefile widget will be reflected in the one on the other computer. Alas, Apple's Dashboard is quickly going out of style ... but Junecloud made some of their widgets into Mac programs, so my fellow Mac users with a newer version of the Mac OS than 10.10.5 can use the Notefile program instead. Of course, as they said over and over (and over!) again in the original "Spiderman" movie, "With great power comes great responsibility." 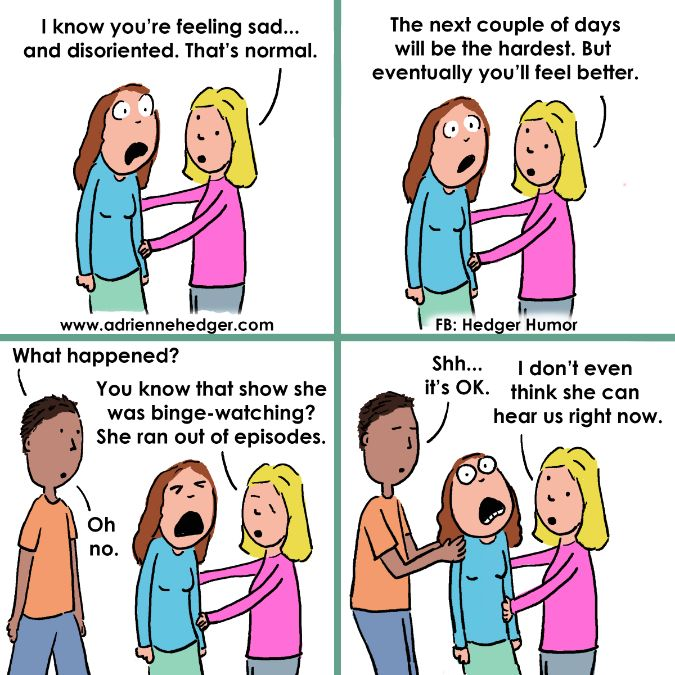 The hazards of "binge watching." ... and a big thanks to Ms. Hedger for coming up with that cartoon! Here it is, the story you've been waiting for! A few months ago, I was trying to download an episode of "Marvel's Agents of S.H.I.E.L.D." ... and just as I was about to rename the downloaded file (I used a different method at that time), it vanished, because the page that the video was on had been replaced by a frelling ad! As you can probably imagine, I was less than pleased, and complained in the Couch Tuner forums about it. That's when somebody recommended that I install AdBlock Plus. I was dubious, but I gave it a try, and wow, what a difference! Before I installed AdBlock Plus, watching a video was almost like playing a game of Whack-a-Mole, where the moles are pop-up ads. I remember one rather nasty incident, where I got a pop-up telling me that my Mac had a virus -- with an actual voice, mind you -- and the ad was accompanied by an error message which contained the text that the voice was reading. Each time I clicked "Okay" to get rid of that message, another tab with the same ad would appear, and I just wasn't fast enough to kill the message before another tab opened up! I had to restart the browser to get rid of it. After installing AdBlock Plus, all I have to do now is click "Play" on a video I want to see, and it starts playing. No ads (well, mostly), no messages telling me that I simply *MUST* install this Flash update -- despite the fact that I had just updated it the day before ... oh, and hey, that's not Adobe.com that link's pointing to ...! So that's why I am a big fan of AdBlock/AdBlock Plus. Want To See What CouchTuner Looks Like Without AdBlock Plus? And that's how I watch TV on my Mac. Good luck! I hope this works for you.